To the east of the famous Isis temple on the island of Philae in Upper Egypt, workers and archaeologists are busy at work. They are cleaning and restoring the massive stone blocks that once formed the temple of Hathor, which is being rebuilt and restored in order to be officially inaugurated next month. Time has since taken its toll on the temple, which was built by King Ptolemy VI and extended during the reigns of Ptolemy VII and Roman emperors Augustus and Tiberius. Many of the temple's stone blocks have deteriorated; its walls, meanwhile, are riddled with cracks. According to antiquities ministry officials, the temple's deteriorated blocks have been replaced with new ones, while fallen blocks have been returned to their original positions. Poor restoration work undertaken previously, meanwhile, has been corrected. 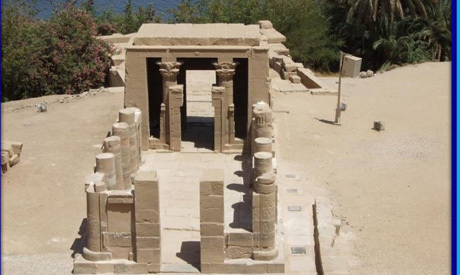 The temple consists of a colonnaded kiosk bearing 14 Hathor-headed pillars, a pronaos (vestibule) and a cult terrace facing the Nile River. Among the temple's most impressive reliefs is one depicting a group of musicians performing before an assembly of ancient Egyptian deities.